Some days, you realize just how much of a Regular Joe you are. I ran the Morgan Hill Freedom Fest 5k this morning, and got absolutely crushed by some of the Bay Area’s elite 5k runners. The male winner won in 14:42, and the female winner in 16:40. The current men’s world record is 12:37. That’s two minutes faster than today’s winner, though he would have been the world record holder if he’d run 14:42 in around the year 1910. But whatever: 14:42 is seriously fast — 4:44 per mile, and that’s the average over 3.1 miles. I can only dream. I’ve had a goal in my head for years of running under 20:00. I’d be happy to just run 19:59 once in my life. I know that when I was about 28 years old, I ran 3.1 kilometers in about 12:35 once or twice. If you do the math, that’s about 19:30 for a 5km if I could have kept the pace up over a 5km race. I just never quite got around to trying that pace in a race. And now I’m 45 years old. The site of my fastest times ever. 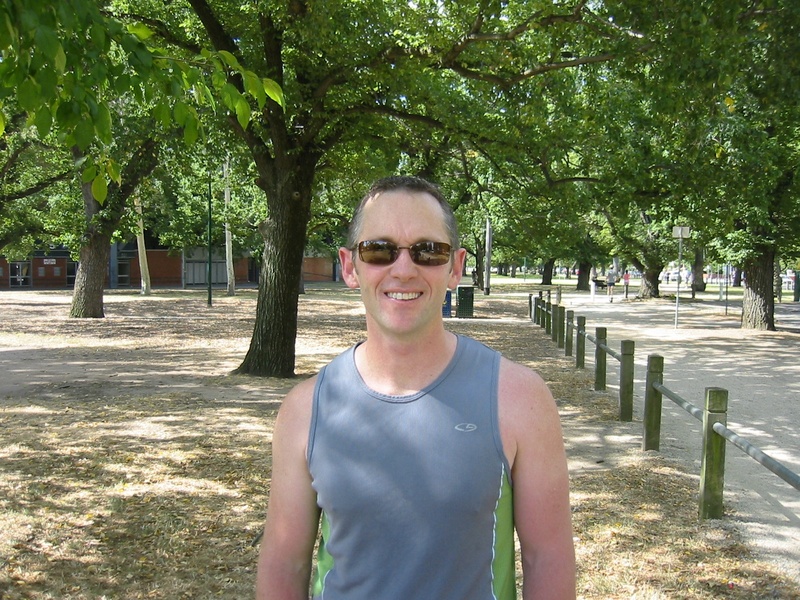 Princes Park in Melbourne, Australia, circa 2007. I’ve run this counter-clockwise maybe 1,500 times, and clockwise exactly 0. My best time this year is 21:06, if you don’t count the Double 5k that I ran in 20:15. The Double 5k is broken down into a 3km race, a one hour rest, and a 2k race, so it doesn’t really count. A time of 21:06 is a long way off 20:00. If I want to get there, it’s probably time to drop a few pounds, train three or four times a week, and get serious. What do you think? Anyway, I digress. The race this morning was flat, fast for everyone else, and a great temperature. I’ve been having ankle troubles, and I think I was just a little “off” physically this morning too. The bottom line was a pretty average time of 22:56. I was annoyed at myself, but I guess I should be happy to have run race #22 this year and got out and run on a beautiful July 4 day! Happy 4th to all of you here in the USA. See you next time — I’ll be running a 10k trail race next week that looks *gorgeous*. Previous PostWeekly update: we are over $35,000!Next PostWeekly update: 22 races, nearly $37,000! Hugh, I sympathize on so many levels–having been a runner in high school it is frustrating to see the limits age imposes on performance. I certainly can’t claim to have solved this for myself, but you’ve clearly drawn inspiration from the challenges you’ve faced in the past and turned it into motivation to excel. The Fifty-Two Fives endeavor you’ve embarked on strikes me as a relevant parallel case of turning adversity into a drive to better yourself. I think you can set 20:00 as a goal and hit it in the coming 30 races. It might take some research on workout plans, and then the right race with a flat course and the right playlist to get you in the groove, but I believe in you. Give it a shot!